October 2, 2013 marked the first performance of the San Francisco Opera’s new production of Giuseppe Verdi’s final opera Falstaff. Bryn Terfel in the title role was the show’s big attraction. 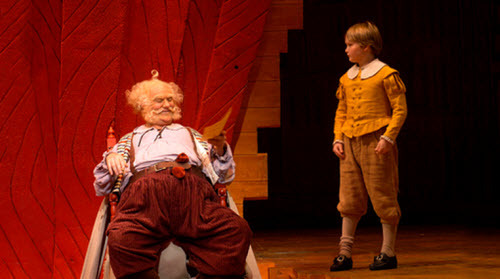 Over the past 50 years I’ve seen more performances of Falstaff than I can remember. Terfel’s impersonation was by far the best. He’s been doing the part for 14 years and has every gesture and nuance to perfection. He is Falstaff. That he has the most beautiful bass-baritone voice in living memory makes his appeal irresistible. His involvement with part stands in amazing contradiction to his lack of involvement as Wotan during the Met’s recent staging of Wagner’s Ring. Though Falstaff is an ensemble opera he dominated the stage. In the second scene of the first act, the only one Falstaff does not appear in, the action sagged a bit. This production, borrowed from Chicago’s lyric opera makes use of a unitary set which opens, folds, and allows the performers to descend below the stage. It’s very effective and makes the breaks between the opera’s six scenes brief to non-existent. Despite the few nits I’ll pick below the whole show was a triumph. Verdi’s quicksilver score baffled much of the opera audience for a long time after its premiere in 1893. Almost 80 at that time, he said he wrote the work for himself – the only time he left the audience on its own. His melodic invention, dazzling orchestration, and breakneck pace required the listener to pay rapt attention or miss much of what was happening. Some observers said there were no melodies in the piece. In actuality, there are more than in any opera by anyone. They just appear and move on so quickly that if you don’t know the score, they’re easy to miss. Well, 120 years later most opera devotees know the score and Falstaff ranks 32 among all the operas performed in the world. The conductor is as important to this opera as any of its soloists. Nicola Luisotti is a very gifted leader of Italian opera. He kept things moving at a brisk pace. Falstaff”s 9 and 10 part ensembles require extraordinary coordination. Luisotti managed these with skill, especially the fugue that ends the work. I felt a little more speed would have helped at the end of the first scene where Falstaff chases Bardolfo and Pistola from the Garter Inn,. Similarly the intricate pieces in the second scenes of both the first and second acts should have moved a little faster. If you want to hear Falstaff conducted to perfection get a copy of the Met’s broadcast of the opera on February 26, 1949 under the direction of Fritz Reiner. The best conducting of Falstaff I’ve ever heard. The rest of the cast, with one exception, was splendid. Ainhoa Arteta was both personally and vocally attractive as Alice Ford. Renée Rapier made as much as is possible as Meg Page. Meredith Arwady camped up a storm as Dame Quickly, one of the great character mezzo roles in opera. Her voice was as good as her acting. Joel Sorensen, Greg Fedderly, and Andrea Silvestrelli were all appropriately seedy as Dr Caius, Bardolfo, and Pistola, respectively. The young lovers, Nannetta and Fenton were well sung by Heidi Stober and Francesco Demuro. Stober was particularly good. Demuro milked his curtain call for at least 10 seconds more than he should have. This leaves Fabio Capitanucci who made his San Francisco Opera debut as Ford. Ford, ostensibly, secondary to Falstaff, is a great part. In 1925 at the Met the young Lawrence Tibbett as Ford stole the show from Antonio Scotti’s Falstaff with his powerful singing of “È sogno? o realtà” – the opera’s only traditional set piece. Capitanucci is no Tibbet. His sound is underpowered and actually collapsed at the end of “È sogno?” He got through the rest of the piece without anything untoward. Frank Philipp Schlössmann’s costumes were all period specific and added color without distraction to the production. The success of the performance was proved by the audience’s reactions. They laughed where they were supposed to. So nimble was the show that even a narcoleptic could not have slept through it. Fastaff is one of opera’s greatest comedies. I would rank only two by Rossini and one by Donizetti as its equal. Last night the SFO showed why. There are seven more performances at the War Memorial Opera House between now and November 2. If you’re in town, don’t miss it.